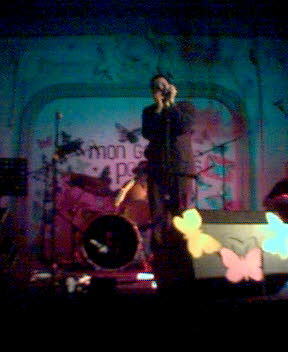 This evening, Your Humble Narrator went to the first night of Mon Gala Papillons, a two-day indie-pop festival organised by Chickfactor, at a rather plush music hall in Shepherd's Bush named, appropriately enough, Bush Hall. 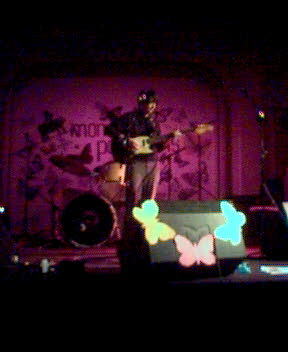 First up was Amy Linton, of Aislers Set fame; she strummed an electric guitar and played/sang a few songs, and was quite good. Seeing her brought back some memories; the last time I saw her play was in a backyard in Clifton Hill, when Stewart and Jen were honeymooning/holidaying/touring in Australia. Next up were a female duo from New York named Mascott. Their set started with one of them (Margaret) on stage, playing violin, as the other played a grand piano (located in front of the stage) and sang. The first song was lovely; it reminded me a bit of another New York resident, Greta Gertler. Afterward, the pianist took the stage and picked up a guitar. Some of the other songs were quite nice, though I thought that the first one stood above them all. Third on was a solo set from Stevie Jackson, of Belle & Sebastian. He went up on stage, smartly dressed in a suit and tie, and started off playing Ode To Joy on the harmonica, before launching into his own numbers. He didn't play any Belle & Sebastian songs that I recognised; mostly his own songs, and mostly ones about girls (because, as he explained, he likes girls). The songs included "Portland, Oregon", "Phone In My Head" (which was particularly nice), and "Lonely Pop Star", as well as a Belle & Sebastian-style rendition of Frosty the Snowman (which someone requested), and a song he said he learned from Alex Chilton toward the end. 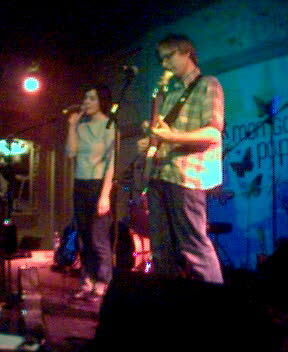 Then on came electro-pop duo Pipas, a girl with shortish brown hair in a stripy top and a guy with a bowlie haircut and glasses in a chequered shirt. They had a PowerBook on stage, which they mostly used to play backing tracks (and a bit of keyboards), over which they played guitar and bass and sang, performing songs off their recent EP and past albums. They were a little shambolic, but generally pretty good. Finally, the Television Personalities came on. I was expecting them to be like XTC or Wire or The Fall or someone, but they were more Mod-revivalist, right down to the bassist having a Royal Air Force roundel and Vespa logo on his bass.